Preparations for the great Aussie Christmas have begun. Most households are busy baking, shopping, wrapping gifts, writing cards, putting up the tree and festive decorations. Many families look forward to celebrating the traditional Christmas Day with loved ones and friends. It’s an exciting time of year – especially for youngsters. Yet all the hustle-and- bustle can be stressful. So how can you best prepare for Christmas and get ready to enjoy the celebrations during this much-loved special season. PREPARE YOUR HEART FOR CHRISTMAS. Christmas isn’t solely about festivities, or the shop-‘til- you-drop rush for gifts or toys. It’s also about the active, caring, tender expression of heart-felt love which we all yearn for and ultimately leads to a love-filled, happy Christmas. Be big-hearted. Offer encouragement and appreciation to those who are doing their best to care for, and teach children to be good citizens and live harmoniously alongside other people. Be good-hearted. Do something unexpectedly thoughtful for someone. Share the gifts of patience, kindness and goodwill with family, friends, work colleagues, other shoppers and commuters. PREPARE YOUR HOME FOR CHRISTMAS. Don’t just decorate your house with Christmas finery. Fill your home with the perfume of peace. Beautify it with the mind-qualities of happiness, stability and security. Adorn each room with the spiritual sparkle of harmony, contentment, and comforting rest, all of which spring from a divine Love. Mentally put out the welcome mat. Create a warm, friendly space. 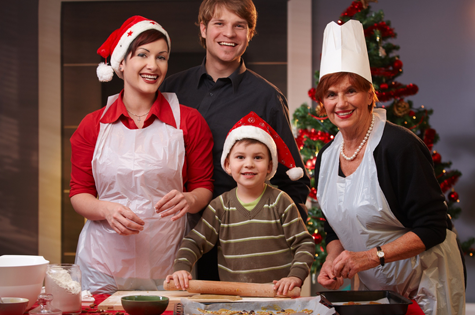 Make your home a haven for family and guests to meet and share Christmas. Relax. Feel the joy and power of the Christmas story told in the Bible, Luke chapter 2. Prepare your heart and home for Christmas! You’ll find it’s good for your health. Thanks so much for those insightful words about Christmas preparations. It will be a joy to prepare myself mentally for this special time of the year. There’s room for more love, forgiveness, open-heartedness, more joy for Christmas and every day of the year.